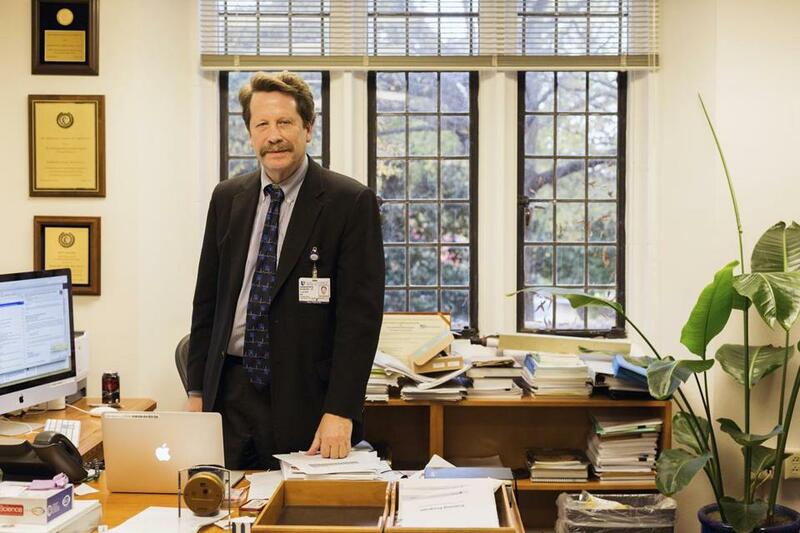 Dr. Robert Califf, shown in his office at Duke University in November 2014. President Obama’s nominee to lead the Food and Drug Administration recently coauthored a series of scientific papers raising concerns about the agency’s oversight of clinical trials but asked that his name be removed before publication, according to other authors. Dr. Robert Califf, the Duke cardiologist first named a deputy commissioner in January and then nominated for the top post last month, was the driving force behind the series, which was published in the October issue of the journal Clinical Trials. The heart of the series is an examination of what are known as pragmatic clinical trials — an increasingly popular type of study that seeks to compare two or more treatments in a real-world setting instead of in a traditional clinical environment. Portions of the papers are critical of the agency and recommend policy changes that would be highly divisive. Califf, who completed most of the series before he joined the FDA, remained as an editor of the publication but asked that his name be removed from the three articles he had co-written, according to other authors and the publisher of the series. He also remained a coauthor on the brief introduction to the series. It’s unclear what prompted Califf to remove his name — a decision that could raise ethical concerns. It is highly unusual for authors of scientific papers to have their names removed before publication. A spokeswoman for Califf said he declined to comment. A coauthor on one paper, speaking on condition of anonymity because of the sensitivity of the matter, said Califf had been told to mask his authorship by the FDA. A spokeswoman for the agency suggested it was his decision. “Dr. Califf requested that his name be removed as a coauthor from these three articles out of an abundance of caution to avoid any perception that he would be commenting as an FDA official through these articles,” the spokeswoman said in a statement to Stat. Califf’s nomination was not seen as controversial, but the removal of his name from scientific papers could complicate his hearing before the Senate. Under guidelines from the Committee on Publication Ethics, a nonprofit group that is focused on best practices in scholarly publishing, author lists must be accurate and complete to ensure all authors receive the appropriate level of credit and responsibility, said Tara Hoke, a trustee for the organization. “COPE would express concern about any decision that might impact the integrity of the authorship record,” Hoke said. The 12-article series edited by Califf and Dr. Jeremy Sugarman, professor of bioethics and medicine at Johns Hopkins University, was underwritten by the NIH Health Care Systems Research Collaboratory, which promotes cheaper and faster large-scale clinical trials, and a nonprofit group known as the Patient-Centered Outcomes Research Institute. Some of the articles argue that current FDA rules make pragmatic trials difficult to conduct. Although the series is a strong call for the expansion of pragmatic clinical trials, critics say such trials won’t produce results that are any more applicable to real-world settings than randomized controlled trials, which have been the gold standard for many years. One of the papers — which focus largely on clinical trials and deal only partially with the FDA and regulation — coauthored by Califf pushes back against skepticism. “We are concerned that current Food and Drug Administration requirements for obtaining individual informed consent may deter or delay the conduct of pragmatic clinical trials intended to develop reliable evidence of comparative safety and effectiveness of approved medical products,” the paper says. Another passage from that article discusses ways to make it easier for researchers to gain consent from study participants — a process critics say has become too cumbersome and confusing for potential enrollees. “We believe that the FDA should have the explicit authority to consider alteration or waiver of individual informed consent when deemed appropriate,” the article notes. Dr. Ross McKinney, director of the Trent Center for Bioethics at Duke, where Califf was most recently vice chancellor of clinical and translational research, said he understood why Califf had removed his name from the three articles, which McKinney said propose “dramatic changes” to clinical trial management. Among the papers Califf withdrew his name from was one he coauthored with Dr. John Lantos, director of pediatric bioethics at the University of Missouri-Kansas City School of Medicine, and others. The article deals with how to determine the level of risk for potential research study participants. Lantos said he also wasn’t surprised that Califf asked that his name be removed from the piece. “The central business of the FDA is determining risk, so the question of whether they will change the way they think about the threshold of minimal versus greater than minimal risks is sort of always on their mind,” he said. The third article Califf initially authored barely mentions the FDA at all. Shannon Brownlee, vice president of Boston’s Lown Institute, a nonprofit public health organization, said she was concerned that Califf’s name had been taken off papers he had helped write. In doing so, the public was being deprived of a chance to fully understand his perspectives and biases. “Rob Califf is a really smart guy, and I’d be interested in what he thinks about clinical trials — but I think the public should know what he thinks about clinical trials as well,” Brownlee said. Sheila Kaplan can be reached at sheila.kaplan@statnews.com. Follow her on Twitter @BySheilaKaplan. Follow Stat on Twitter @statnews.